Hi! I'll keep today's Work in Progress update brief as it's not much different from Sunday's Year of Projects post. First up - the shawl that is now living back in my handbag after making way for granny squares for a few weeks. I've added a few rows here and there and it's coming along. It's not terribly exciting, but after the bright colours I'm crocheting, it's a nice contrast. A nice 'throw over' sweater for Little Miss before our holiday - should only take a few days to make and I already have some pretty and supersoft Patons Smoothie DK so just need to decide on a pattern and I can get started. A hairband/headband to wear my hair off my face - I haven't found anything I like on Ravelry, but I'm thinking a tube knit in the round might do. I have some yarn leftover from the Noro Boneyard Shawl which might work - just need to figure out how many stitches to cast on. A nice but simple lacy scarf to make on holiday with the single ball of Noro I picked up a few weeks ago. 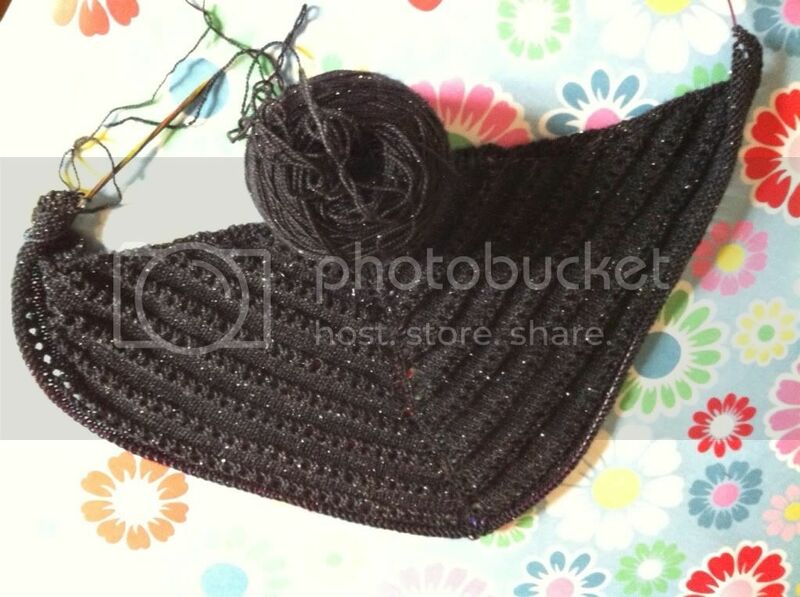 Your shawl is going to look lovely in that yarn, love the sparkle! The blanket is looking fantastic! I'm so excited to see the blanket Ta-Dah! Patons Smoothie is gorgeous (if a little squeaky to knit with) and it will make a lovely sweater. That granny square is so beautiful! Love the colors!!! The blanket is just gorgeous, and I'm in awe at how quickly you've made it. I'm knitting a simple lace stole (it's on rav, sorry no link I'm nak! ), not sure if that's the kind of thing you're after? 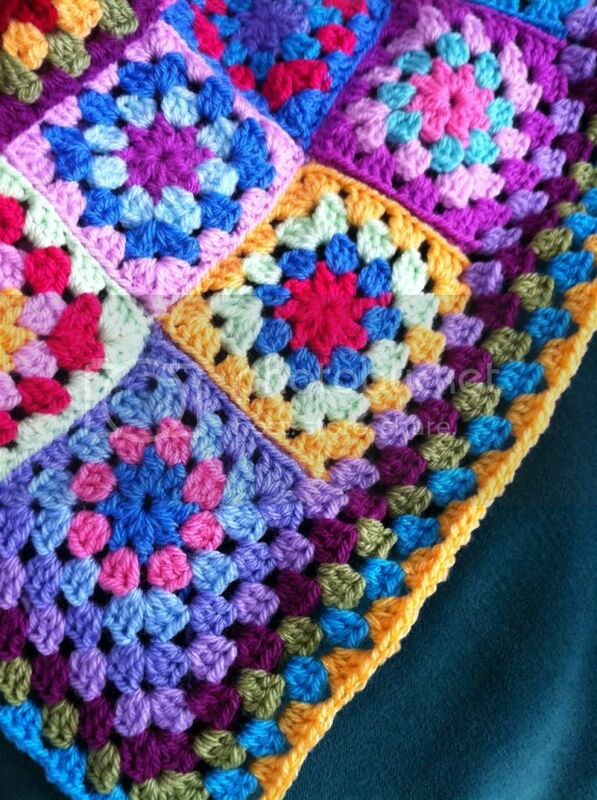 I drool every time I see the colours in your granny blanket! LOVE the blanket!!! The border makes it all come together so nicely.. Great job! The shawl already looks great. And the colors on the blanket are so juicy! Pretty x 2....a little here and a little there, and before you know it, one of the projects will be done. I truely love your blanket! Love the shawl. It's going to be great. The blanket is just amazing!! I've put the shawl in my faves, too. Hooray for long faves lists! I love how the blanket just pops! Good for you on doing Body Balance. I am horrible when it comes to exercise. 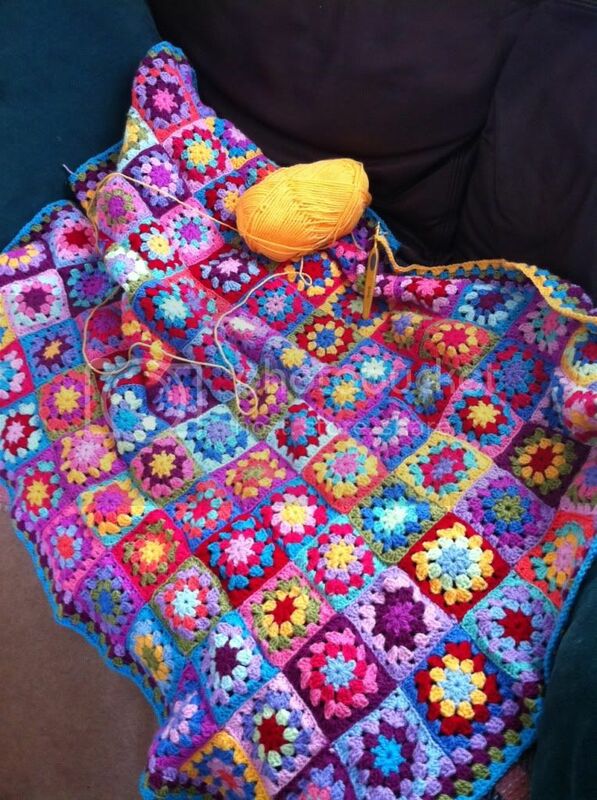 I can see how working on the shawl is relaxing for your eyes after looking at all those granny squares for weeks! Good luck on finishing both projects! I can imagine going crazy with all the granny squares! Love the blanket and shawl. Love the yarn for the shawl. The blanket is coming out awesome!! !